The 34 ITI World Congress in Yerevan is over. ACAR will go on and was happy to welcome new people during the meetings. We aim to have one contact person for artists rights at every ITI centre. The official congress report will take some time. In between we make the keynote for the congress opening by Alfons Karabuda, UN Human Rights Council (Photo left) is accessible. As well we have some motions and declarations which have been adopted by the congress: the declaration on artists’ visa and the motion to support the consolidated UNESCO report on the status of the artists which ACAR both brought to the congress. See also the congress declaration “On the international trade negotiations concerning free intellectual exchange and their implications for the performing arts” (English and French). The International Theatre Festival Baltic Circle was forced to censor the final scene of the piece Ceci n’est pas… (This is not my body) by Dries Verhoeven at Lasipalatsi square in Helsinki on Sunday November 16. The police denied permission to present the artwork in its original form. “As a festival festival director, I am ashamed that Helsinki is the only one of the eight cities where this artwork has been censored” – Eva Neklyaeva, the director of the Baltic Circle Festival. ACAR is an active part of the 34th World Congress programm in Yerevan/Armenia. We have invited an UN expert on Human Rights Council as keyword speaker and an open seminar will inform about recent obstacles and challenges in artists mobility. Keynote: Alfons Karabuda (expert to the UN Human Rights Council) introduces the UN Special Report ““The Right to Freedom of Artistic Expression and Creation”. The aim of the Seminar is to inform about ongoing initiatives and programs to improve the artistic collaboration between theatre artists worldwide. We want to discuss the following questions: What are today the main structural obstacles for artistic mobility and international collaboration beside travel funding? How do institutions, organizations and artists deal with these challenges? 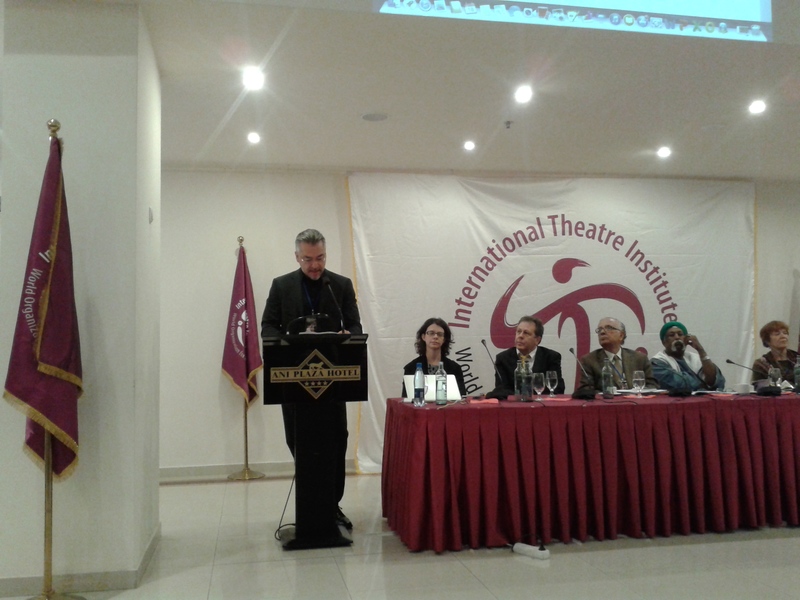 How can ITI support the international cooperation of theatre artists? Wednesday, 19. November 9.00 andThursday , 20 November, 14:30. Tuesday, 18 November 16:15 Meeting with Armenian theatre artists from the independent scene (organized by International Playwright Forum). Via the ITI International Playwright Forum (IPF) we received a staggering report on the recent events on the streets of Hong Kong. I am writing this email in tears, and tears can’t express how heart breaking Hong Kong people are at the moment. As you might aware, HK is in a critical situation where our students and citizens have been fighting for a true universal suffrage in Hong Kong in a non-violent and peaceful movement. Maybe you’ve witnessed through the news on how police have used tear gas and pepper spray at our unarmed students, how peaceful, polite and civilized our protesters have been. Today, lots of gangsters suddenly flocked to the protest area using violence against our students, many of them, some teenage students, were hurt. Sexual harassment was reported everywhere, “You came out to protest and you should be prepared to be sexually harassed.” A gangster shouted at a sobbing young girl in school uniform. police + gangsters, they play a big drama in front of the media and citizens, and all the blame was put on the non-violent protesters. that’s how ugly our government is in an attempt to disperse the peaceful movement without listening to her people. I urge for global solidarity with Hong Kong people in fighting for our basic right to a true universal suffrage which is promised during handover. I urge for global solidarity to request the Hong Kong government to stop any violence on unarmed students and citizens. I urge for global solidarity to free us all from violence, fear and corruption. I urge the whole world to be our witness, to keep an eye on what they are doing, to stop them from hurting their own people. If you can, please support us by whatever way immediately. Go to your local embassy to express your support, requests the HK government to stop violence, wear a yellow ribbon, open an umbrella, invite people to support us in solidarity, or whatever way you can think of. May justice and peace be with Hong Kong. Many European culture organisations and political groups made clear statements against the nomination of the Hungarian politician Navracsics to the new Commissioner for Education, Culture, Youth, and citizenship. The “Stop Tibor Navracsics” campaign on change.org has collected 1850 supporters. Update: MEPs rejected Navracsics, but he could still be commissioner for other resorts. We, the undersigned professional and representative association of independent performing artists with culture, education, civic initiatives, and human rights in our focus, would normally consider it a very positive step and a great honour that a representative of our country may fulfill the post of EU Commissioner for Education, Culture, Youth, and Citizenship. Under the conditions prevailing in Hungary, however, and with hearings just around the corner for your Commissioners-designate, we, concerned European citizens and independent Hungarian artists, would like to ask you a few questions regarding the role of the EU Commissioner for Culture, Education, Youth, and Citizenship. ➢ redesigned the election system to favour the ruling party in such a manner that the upcoming municipal elections are hardly worthy of that name? ➢ replaced authentic unions, organised from the bottom up, with the National Teachers Corps – reminiscent of Mussolini’s authoritarian corporatism – making all teachers automatic members without their permission? ➢ appointed, and despite heavy protests kept in his post “the Prime Minister’s special emissary for raising national awareness of the rule of the law, and for preserving and developing Hungarian cultural values” – a man, who draws attention to himself with his dilettantism, bad taste, frivolous products, and his cheap, recurring anti-Semitic and homophobic rants and discriminatory ideologies? Perhaps you have heard that in the Hungarian Parliament an MP of the extreme right party Jobbik was appointed Commissioner for Culture and Education. The clear message this decision sent was that Hungarian Members of Parliament regard this portfolio as the least important of all. Does your Commissioner-designate not reflect the same philosophy? In the context of current Hungarian politics, would the appointment of any Hungarian MEP to this post not reflect the same? Please, consider our questions thoroughly, and pass your vote accordingly, as to who should fill the post of Commissioner for Education, Culture, Youth, and Citizenship of the European Union. Global expenditure on development over the next 15 years will be defined by the final goal document to be agreed by UN Member States in coming months. If culture is not mentioned, it will be extremely difficult for countries to elaborate policies and provide funds for projects that rely on culture’s role as a driver and an enabler of sustainable development. ‘Culture’ was completely absent from the Millennium Development Goals document. ITI and many other culture NGOs have signed already, you can join the campaign online. 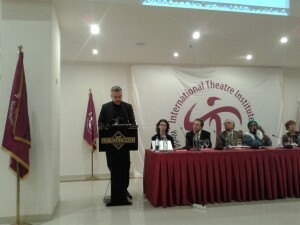 Via ITI Sweden we received an urgent call for help from the Theatre Day Productions in Gaza. Please, read the letter and spread the information. We have made a plan. Rafat (artistic director) in Khan Yunis (south) and Mohammed (deputy artistic director) of Theatre Day Productions in Gaza City are participating with groups who are cooking for the homeless… for those people who have left the rubble of their homes and are sleeping on the grounds around the Gaza Strip. We have spoken to both of them today. They need money for WATER, RICE, VEGETABLES & MEAT plus BEDDING, DISINFECTANT MATERIALS, & ANTI-INFLAMATION MEDICINES. We have calculated that a hot meal will cost 1 EURO for each person. Theatre Day Productions opens their account to receive contributions to feed the homeless in Gaza. The money collected will be sent to the TDP volunteers who are already working in the areas where they live and who will further identify where help is needed. Mohammed and Rafat say they are keeping the names of the people they are feeding to make sure they don’t lose anyone and to reach more of those in desperate need. The enormous destruction of the war in Gaza has left thousands of families homeless. They are camping in the streets and sheltering in gardens without anything… all possessions gone. Our friends and colleagues in Gaza, actors, directors, artists, and designers are out there, trying to reach out to those in need. Help us Help Give – WATER, RICE, VEGETABLES & MEAT plus BEDDING, DISINFECTANT MATERIALS, & ANTI-INFLAMATION MEDICINES. Via the Danish ITI centre (thank you, Susanne) we received a report about the present situation of theatre and theatre artists in Greece. Read “Greek Art in State of Emergency” by Elli Papakonstantinou, artistic director of “Vyrsodepseio” network and performance space, Athens/Greece.